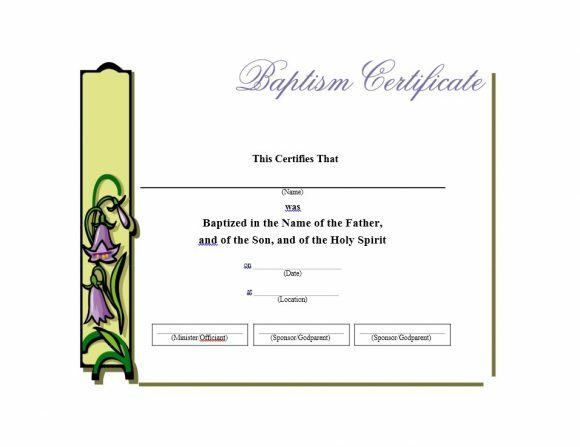 10 How do you get a copy of your baptism certificate? It also includes the name of godparents. 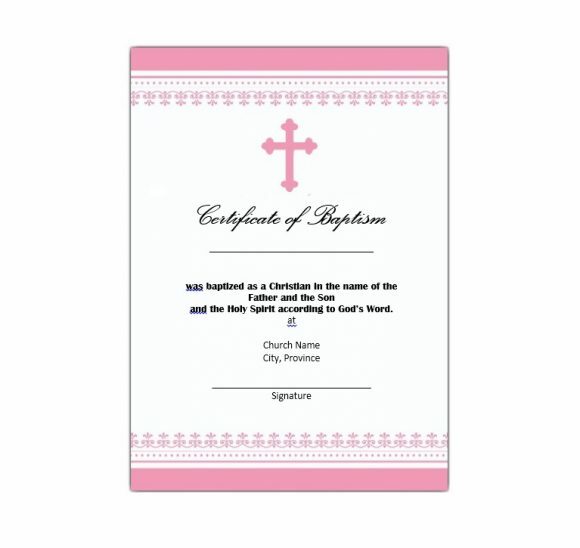 This happens in the case of Catholic baptism certificate templates. 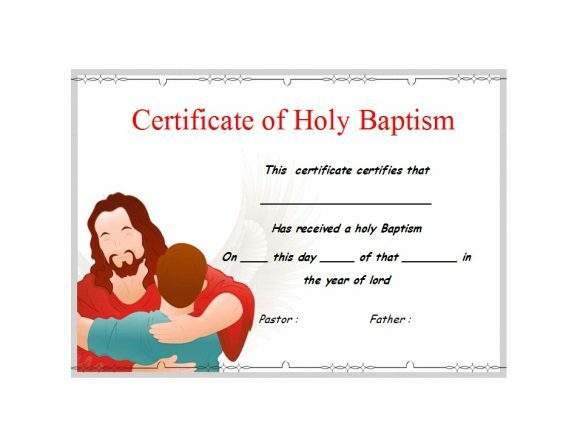 Some churches and religions must need a copy of its certificate for a child’s first communion. It plays importance in a couple’s wedding. 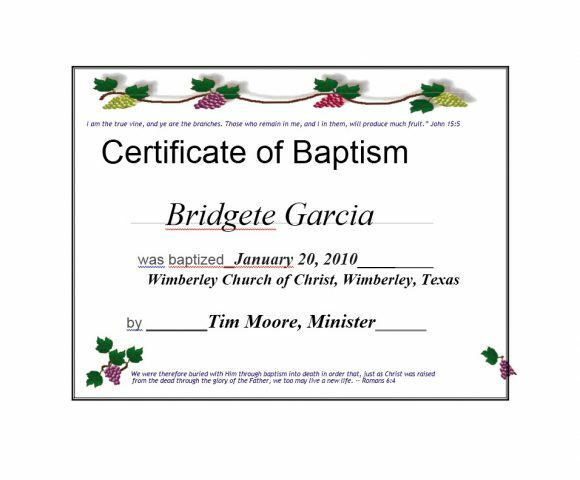 In some cases, older versions of this certificate may even serve as an identification of a person. 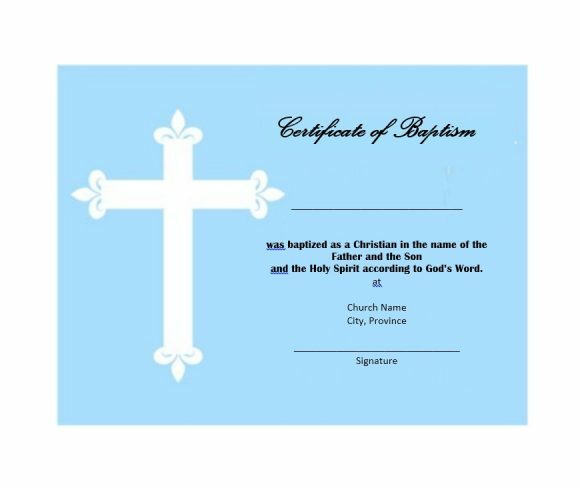 A baptism certificate template in the Catholic religion is a meaningful symbol. Along with the ceremony, it represents the baby or child’s new life in God. 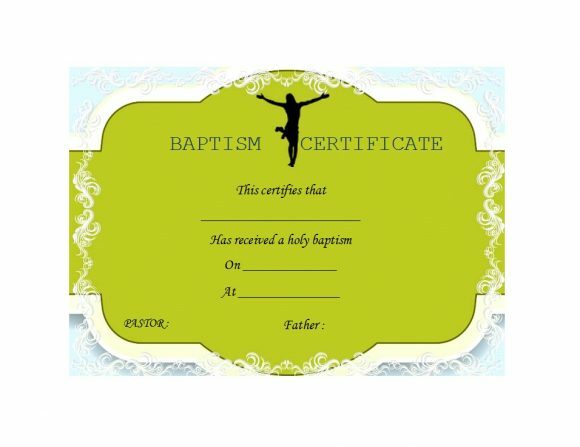 When the parents get the certificate, they may have it framed or even keep it in a scrapbook. Usually, such a document comes from the church. 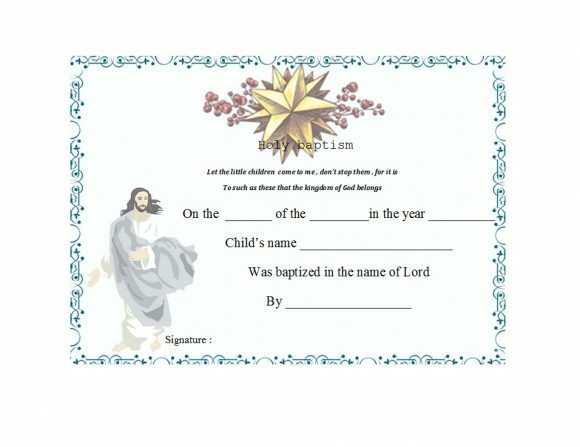 However, you can also make your own template then have it signed by your minister or priest. 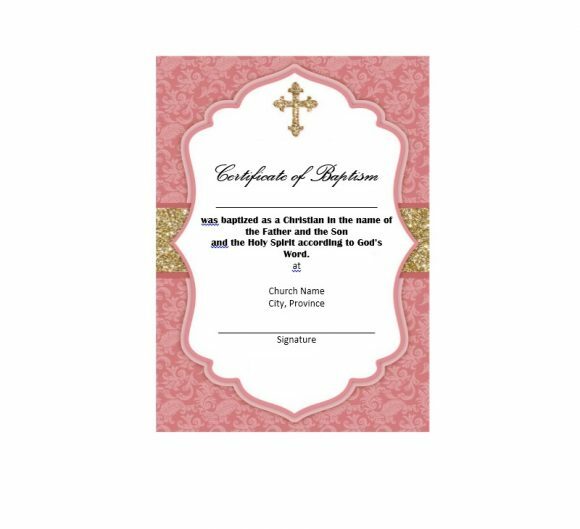 The one that comes from the church may serve as your official document while the one you make can be your keepsake. 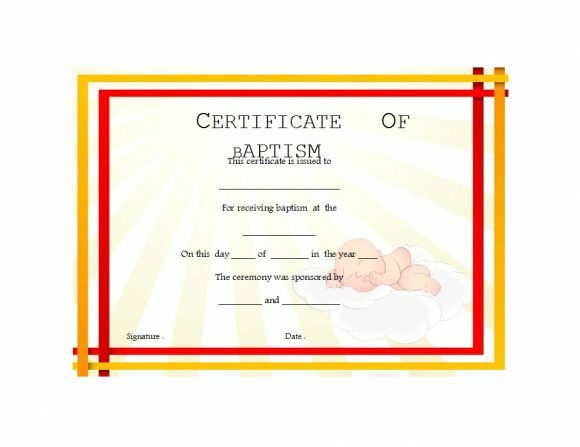 In this article, you’ll learn all about baptism and the certificate that comes with it. 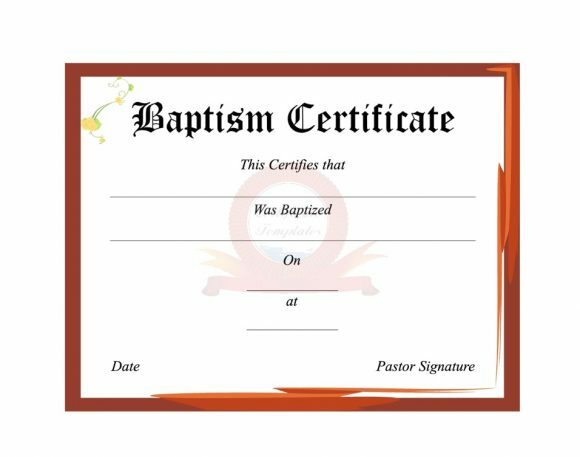 Baptism is a very symbolic process. It is also considered as the foundation of a Christian life. People look at it as the gateway to living a life in the Holy Spirit. 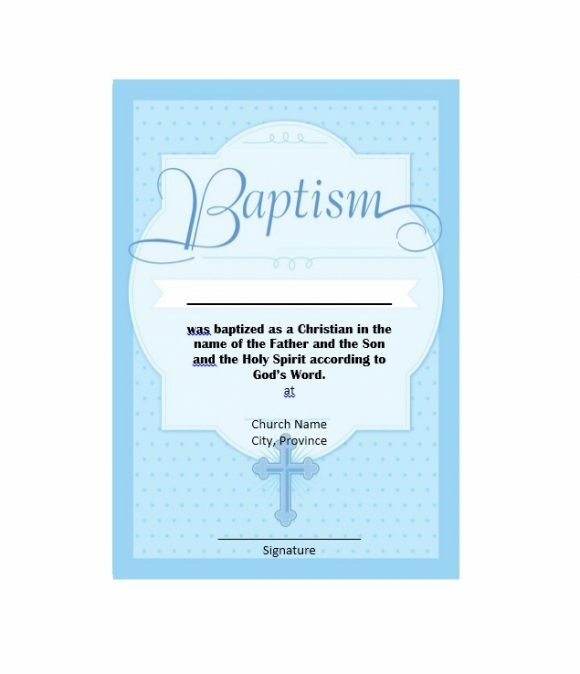 Baptism also opens the door to all other sacraments throughout a person’s life. 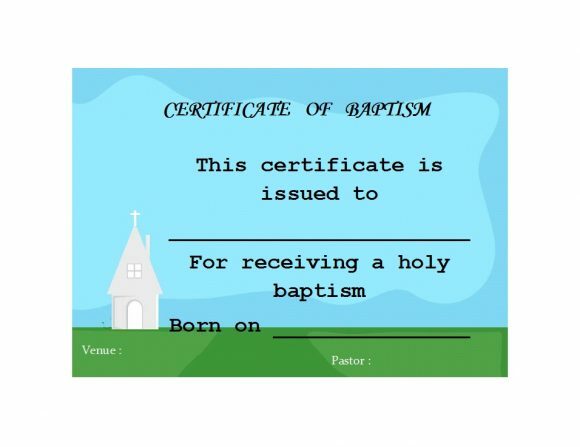 Usually, parents have their child baptized while still young. 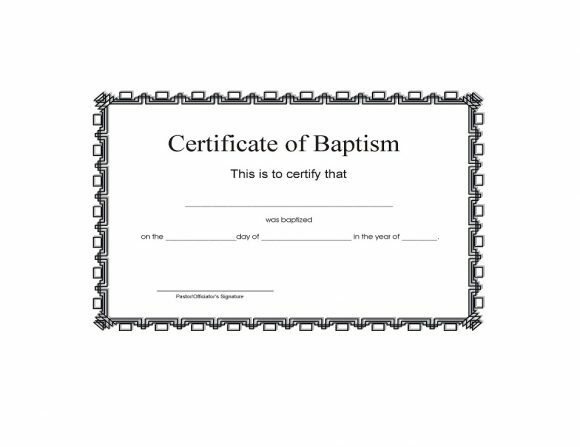 But actually, anyone may receive the sacrament of baptism. Through this sacrament, a person gets reborn as a child of God. 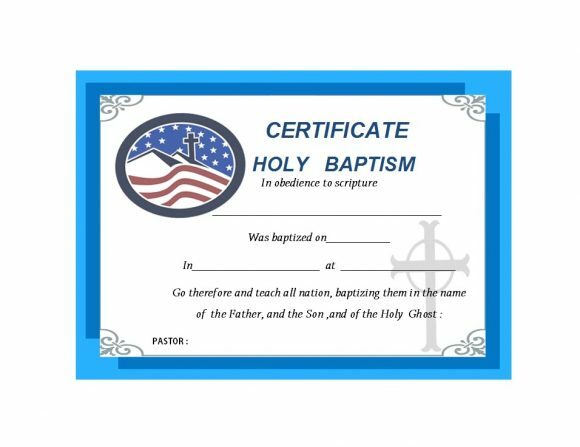 The words “to baptize” mean “to immerse” or “to plunge.” So the sacrament usually involves an immersion in water. Either that or the priest pours water over the individual’s head. Symbolically speaking, the sacrament represents the person’s union with Jesus Christ’s death. Jesus rose from the dead and so the individual also “rises” as a new member of the Catholic church. During the ceremony, the priest immerses the person or pours water over his head thrice. They do so by reciting some holy words. 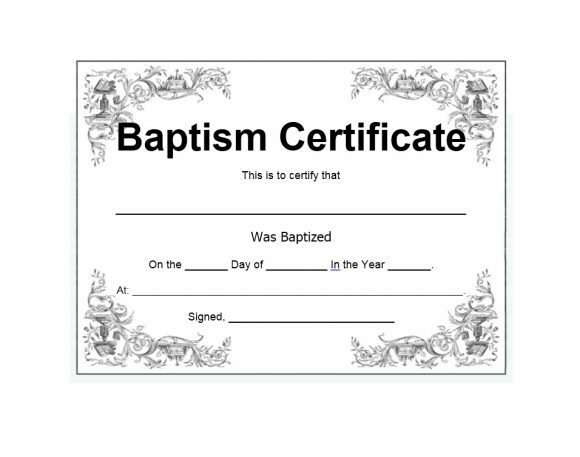 People who already had the sacrament of baptism in a traditional Christian setting. They don’t have to go through it again to join the Catholic church. 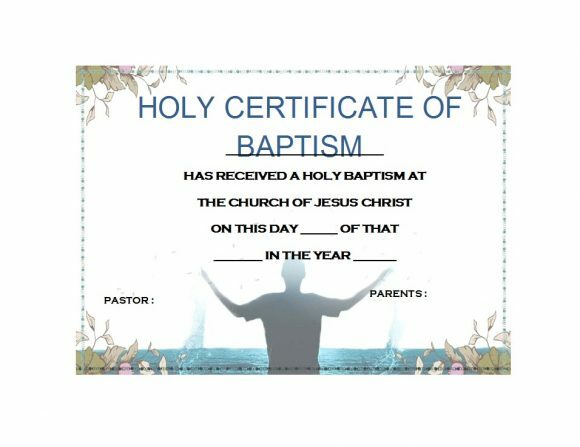 Baptism is a holy and symbolic sacrament. Because of this, there are also a lot of common symbols involved in the sacrament. Let’s go through these symbols next. 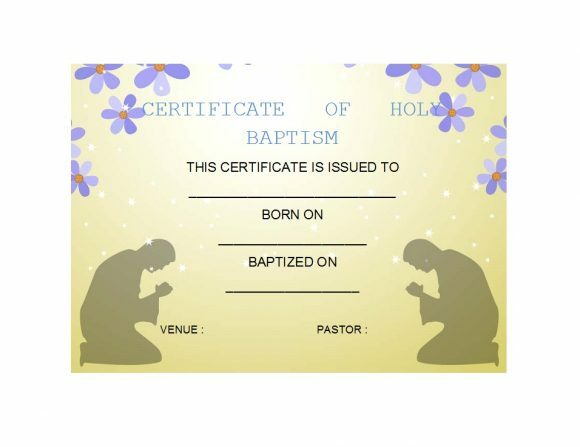 When a person gets baptized, it’s said that Holy Spirit goes into the person. He would start to have a relationship with Jesus Christ and with his church. It is true that sins may conceal the effects of the sacrament. But they aren’t powerful enough to end God’s fidelity. This is why the sacrament of baptism isn’t repeated. 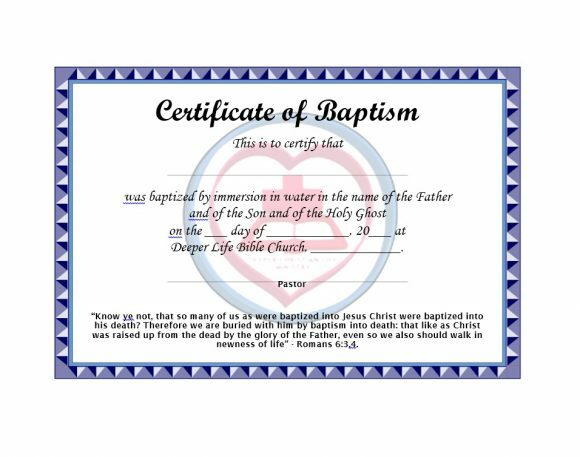 The very first symbol of the baptismal ceremony is the assembly of the person’s community. Assemble doesn’t entail random people who meet in a certain place. Rather, it’s the gathering of a worshipping community. 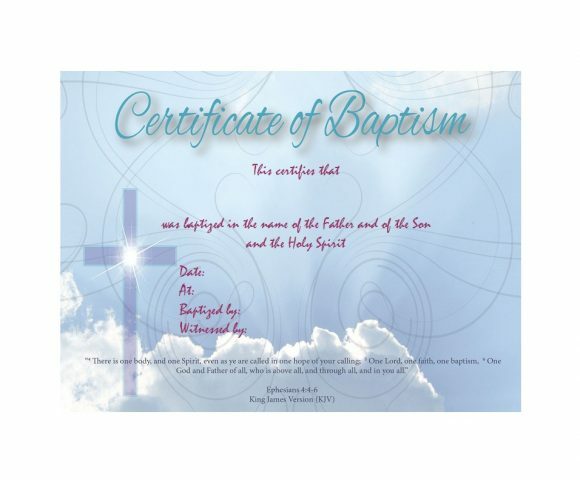 It is related to the person who is getting baptized. They assemble at the church to hear God’s word and witness the child’s baptism. Before the ceremony begins, the priest will trace the sign of the cross on the person’s forehead. Parents and godparents are also encouraged to do the same. The cross symbolizes the love Jesus gave for his people. It also serves as a sort of “branding” that the person belongs to Christ and the church. During the ceremony, the priest reads the scripture or the Word of God. The priest does the reading whether during the mass or outside of it. It talks about how God calls all His children to be His disciples as Jesus did when he was still alive. 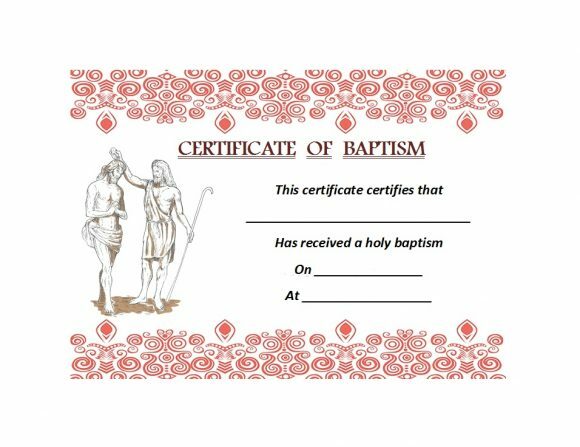 Another symbolic part of the sacrament is the baptismal promises. Here, the people surround the baptismal font which holds the water for baptism. Usually, one of the parents holds the baby. Then, the priest asks the parents what they want for their baby. 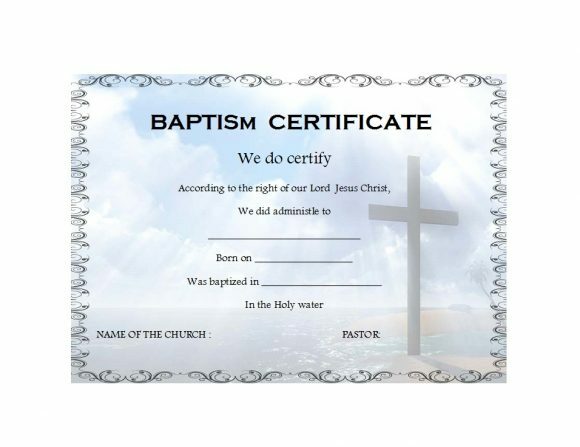 The parents say, “baptism,” and state the baptismal promises on their child’s behalf. After the promises, the priest will pour the water over the baby’s head and say the hold words. The water symbolizes cleansing and it represents the washing away of sins. 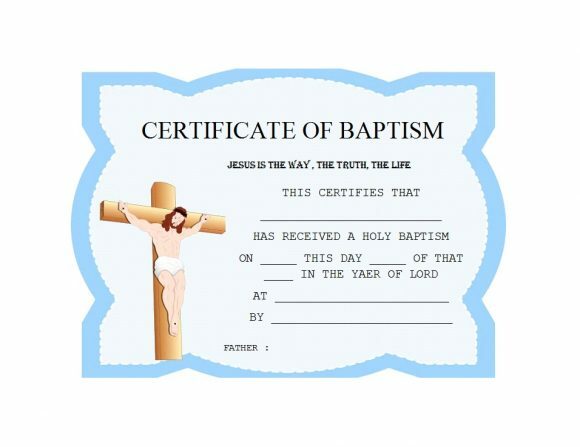 Baptism is a sacrament which cleanses a person of his original sin. They say everyone’s born with it. Water also symbolized life because we won’t survive without it. It shows that Christ’s life as he rose again also belongs to us. Without water, nothing can survive and so it’s also a symbol of the new spiritual life of the individual. 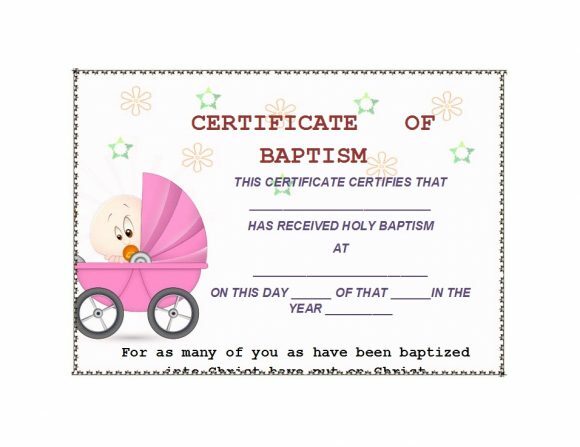 Within the baptism ceremony, the priest will rub oil on the baby’s breast. It’s a symbol of giving strength to the person for all of life’s future struggles. 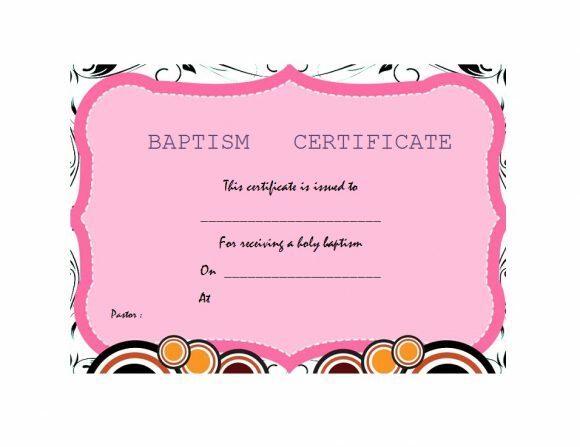 The baptism oil is usually a mixture of balsam and olive oil, rubbed on the chest and on the baby’s head. 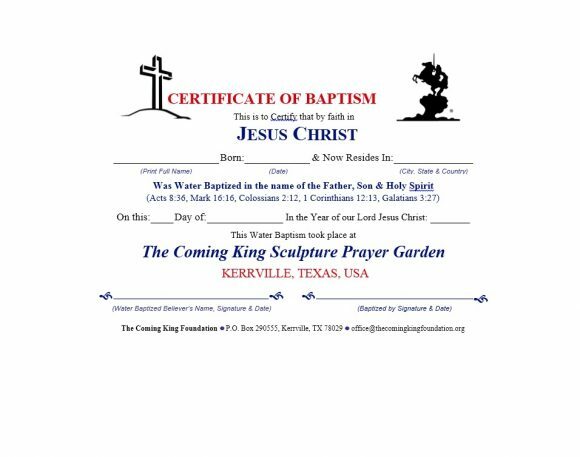 This represents sealing with the gift of the Holy Spirit. Along with this, parents make a profession of faith on their child’s behalf. During the sacrament of confirmation, your child will confirm your profession of faith. Also, the priest will use the oil again. 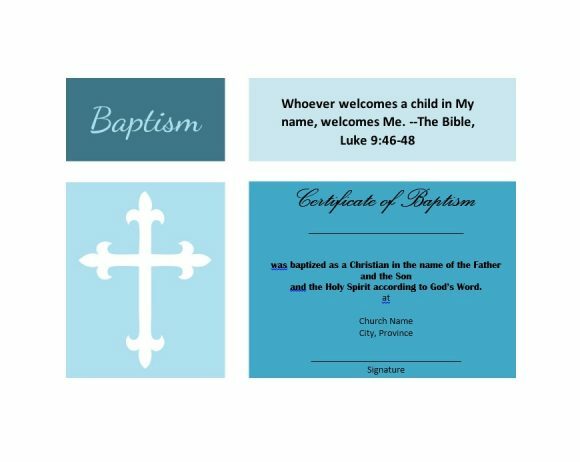 To symbolize the baptized baby’s new life, the parents will light a baptismal candle. They will take the flame from the Easter Candle. It represents Christ’s light, which is the Light of the World. This is a very symbolic light as it represents light which darkness cannot overcome. The light provides warmth, encouragement, safety, and illumination. So at that moment, the baptized baby opens his eyes to the light of life and creation. The baby’s flame of faith awakens and he starts to see things through the eyes of Christ. Usually, during baptism, parents dress their babies in white. This symbolizes the new life of the child in Christ. You may use a white shawl, a gown or any white garment. It’s a lot better if it also bears a cross on it. The garment’s color represents purity, life, innocence, and newness. It’s also a strong symbol of resurrection. 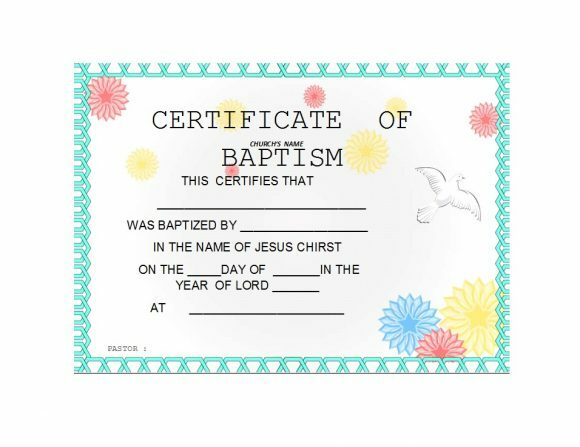 After the baptism, you will receive a baptism certificate. 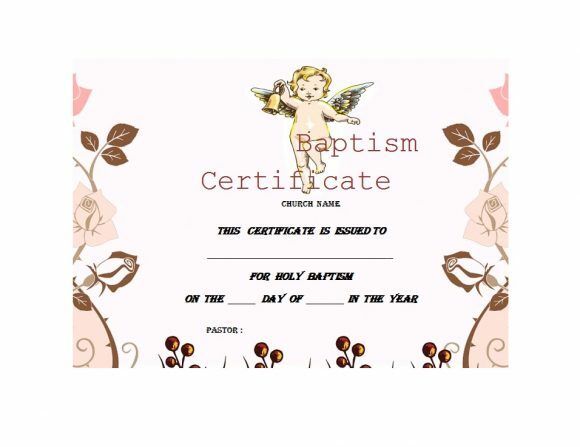 The church will also record your baby’s baptism in the Baptismal Register. Keep the certificate in a safe place as you might need it in the future. If you want to display this certificate, you may have the original one framed. 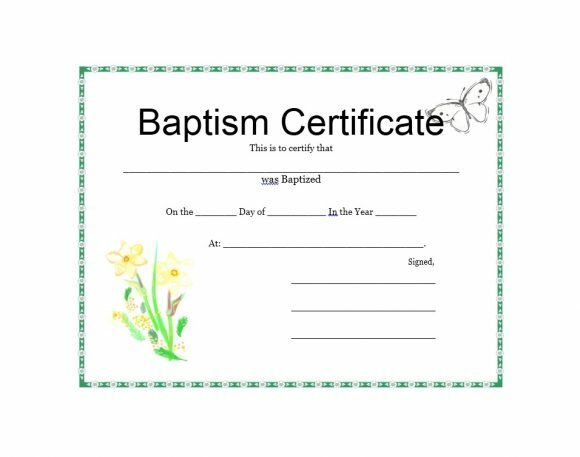 Make your own baptism certificate template, have it signed, and frame it. 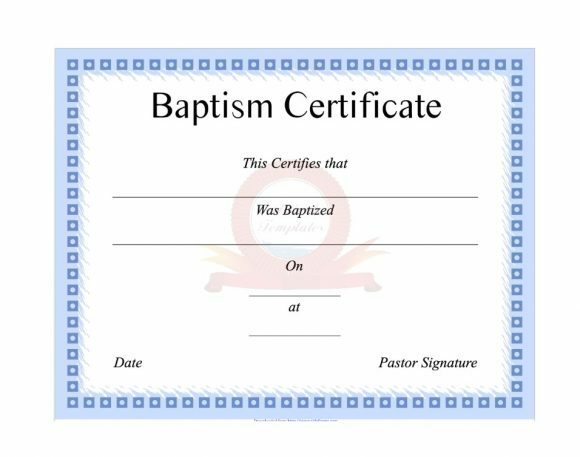 There are a lot of symbols used in baptism because it’s a very symbolic sacrament. It’s a holy event which isn’t taken lightly. 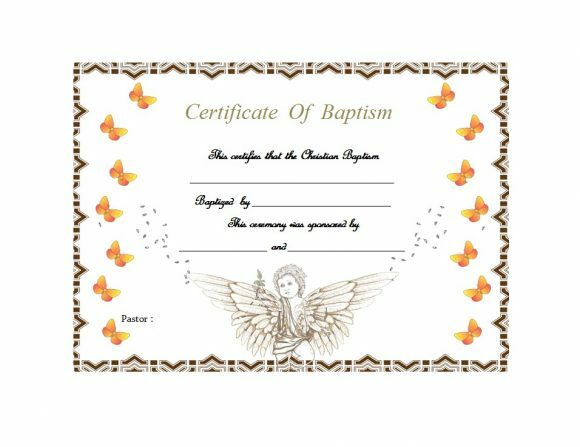 We’ve mentioned how you can make your own catholic baptism certificate template. 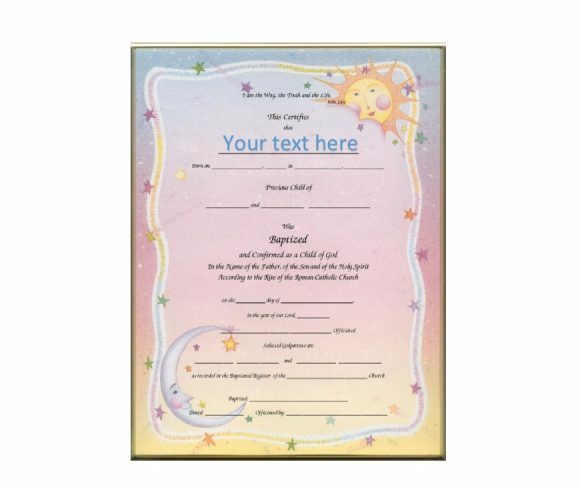 In the next sections, we’ll be discussing how you can make your own certificate to remember the occasion. 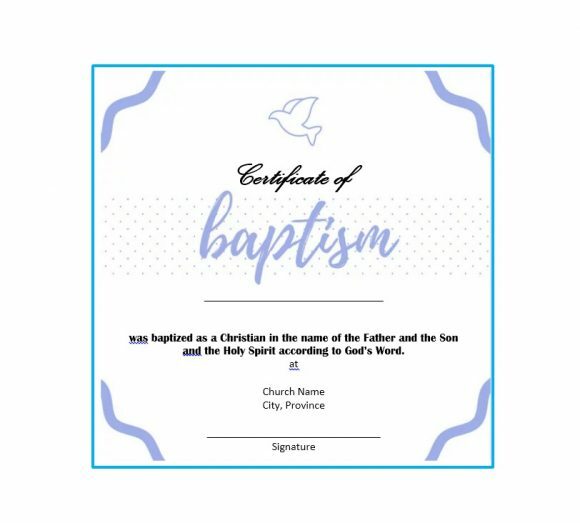 It’s quite easy to make a baptism certificate template. You just need a few materials as well as some information on how to go about it. If you’re planning to make a template for all your kids, then make one with a gender-neutral design. You can make your own template using different software on the computer. Usually, people create templates in Microsoft Word or Microsoft PowerPoint. These are the easiest software you can use to create a template. If you don’t want to make your own template, you can search online for free ones. In this case, all you’d have to do is download the template and fill in the relevant information. When you’re done filling in the information, you also need to find the right kind of paper. 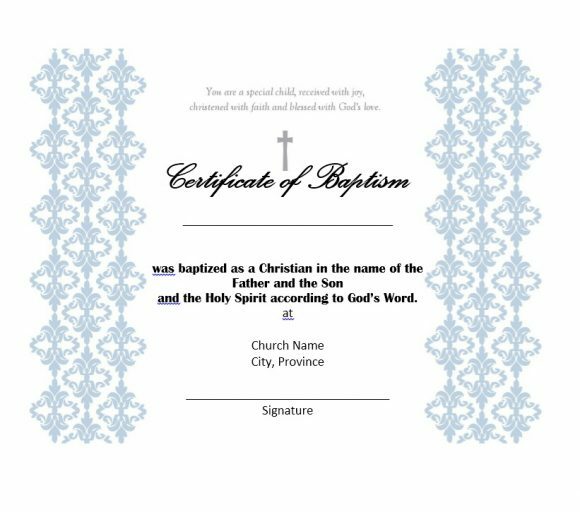 You can choose to print the certificate. Choose a good type of paper, one that would look great as a certificate. The certificate paper shouldn’t be too thick or too thin. A paper that’s too thick might not go through the printer. On the other hand, a paper that’s too thin might rip. When you make your own certificate, you can also include a message in it. Think of a message, you may need a lot of thought. It is especially if you want it to be meaningful and memorable. Having no idea of what kind of message should appear on your certificate. You can ask the priest and one of the church elders or someone who’s knowledgeable. 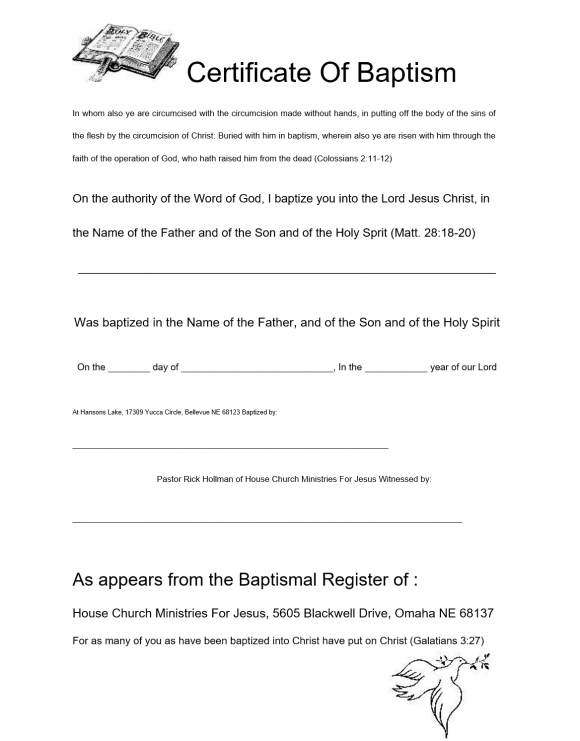 If your church requires certain phrases or wording on the document, you may include it. When you write your message on your computer, think about who it’s for. 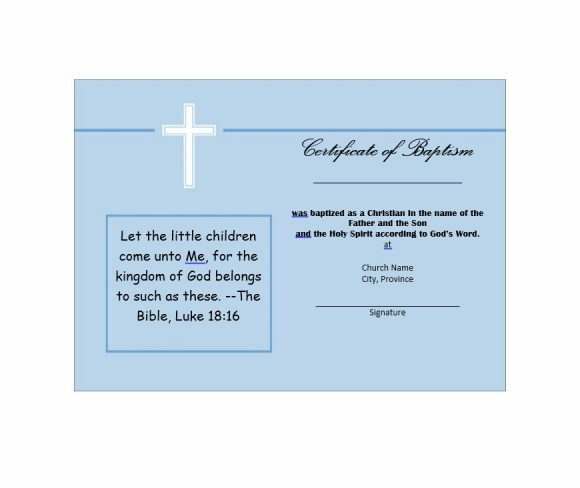 If the message and the certificate are for your own child, the words may pour out from you a lot easier. The message should be heartfelt and sincere. You don’t have to make it too lengthy or wordy. The important thing is that it comes from your heart and it’s meant for your child. 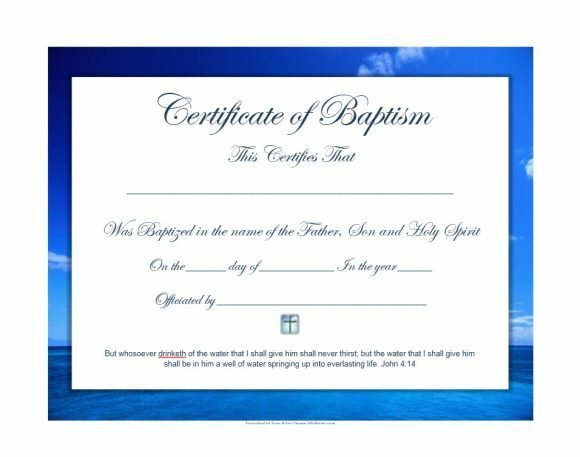 When you’re making a Catholic baptism certificate template, make sure there are places for godparents to sign. You can add borders, images, and other elements. Do it if you want when customizing your certificate. 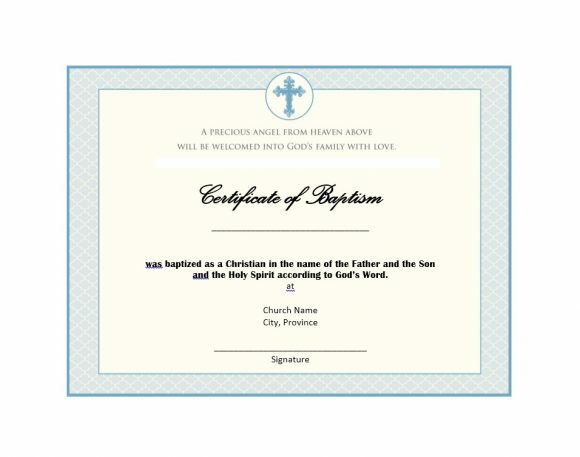 Before you print the certificate on the paper you’ve bought, print out a sample first. Check if all the information is correct and if there are any grammatical or spelling errors. Proofread the document first before you print out a final copy. Also, save the file on your computer so you can use the template again if you need to. If you’re tech-savvy, you can create your template from scratch using a blank document. 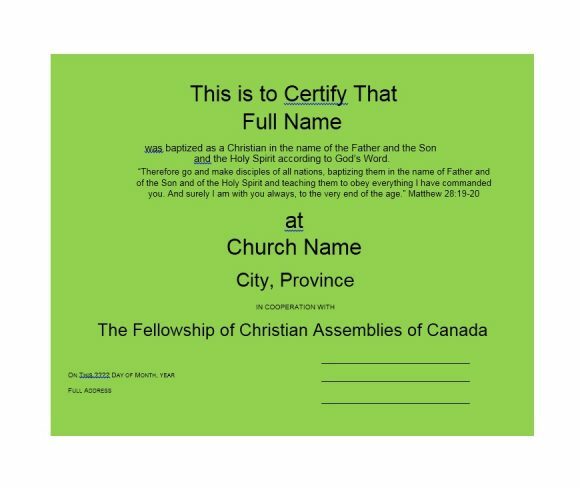 If this intimidates you, then you may consider other ways to create such a certificate template. You may download a template, edit the details or the information, and get it printed. 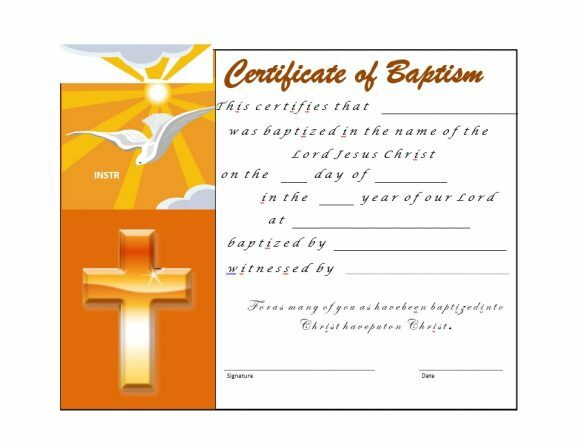 When you do this, you can have the certificate printed on materials other than paper. 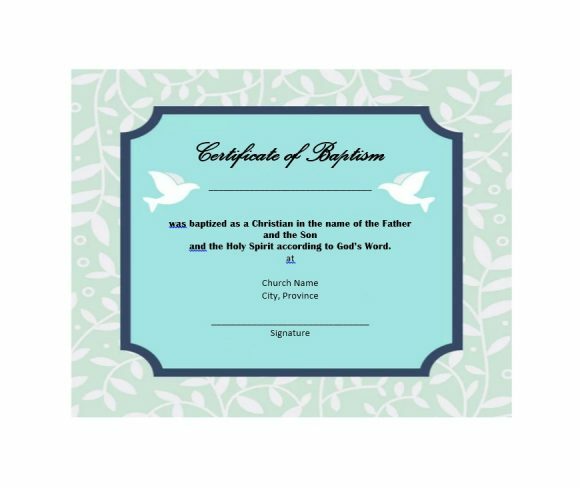 You have the option to print the certificate on card stock or on something thicker so you don’t have to frame it. There are many online sites which offer printable certificates. You can choose from the different designs as well as the wordings on their samples. If you have great handwriting or you can use calligraphy, this would also be a great way to make a certificate. In this case, print out a blank certificate. Use calligraphy to print the necessary information. This adds a unique and personalized touch to the document. 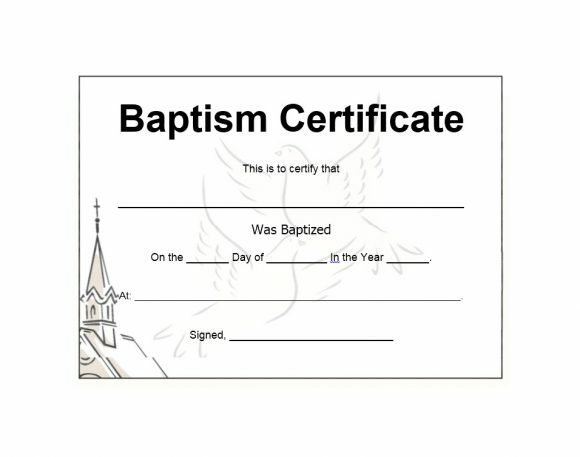 How do you get a copy of your baptism certificate? 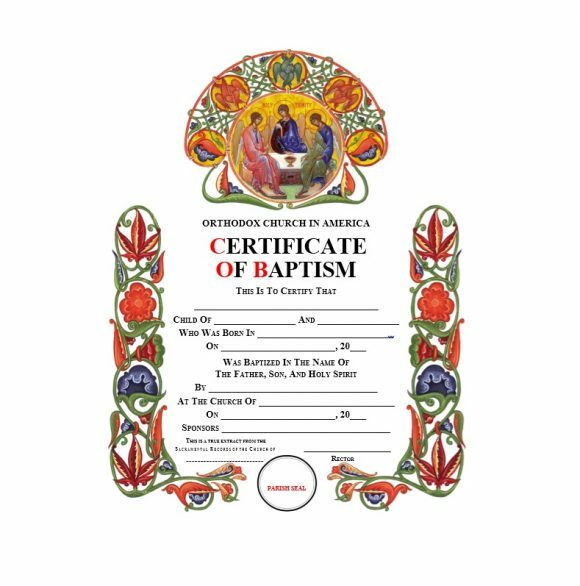 There may come a time when you want to get a copy of your baptism certificate. You may need it for a specific purpose, like if you’re planning to get married. 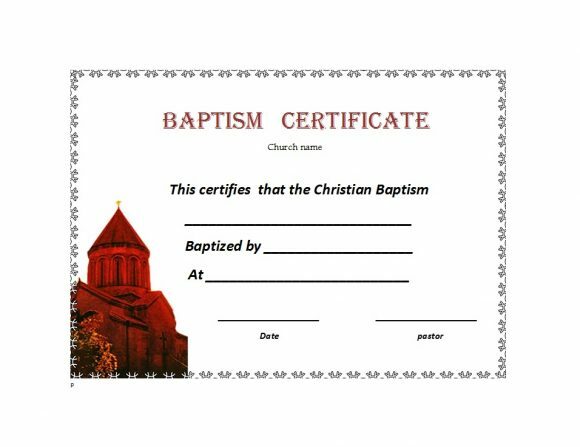 Or you may want to get a copy of your child’s certificate as a need for something, say for his confirmation. 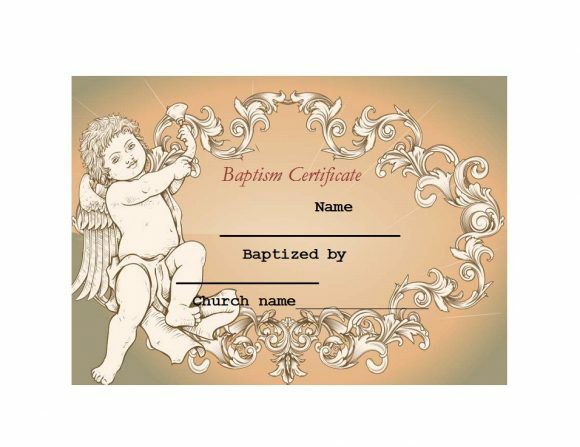 Write a letter to the church or parish where you or your child received the sacrament of baptism. In the letter, make a request for a copy of the certificate. 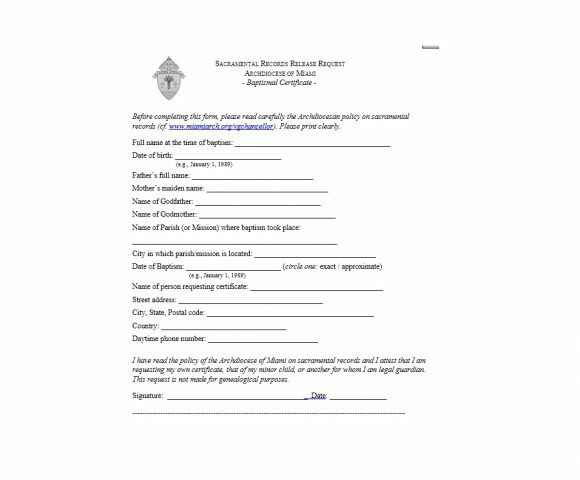 If you don’t receive a response after a few days, then give the church or parish a call and inquire about your request. In some cases, you may have to fill out an application request form and pay a minimal fee if necessary. 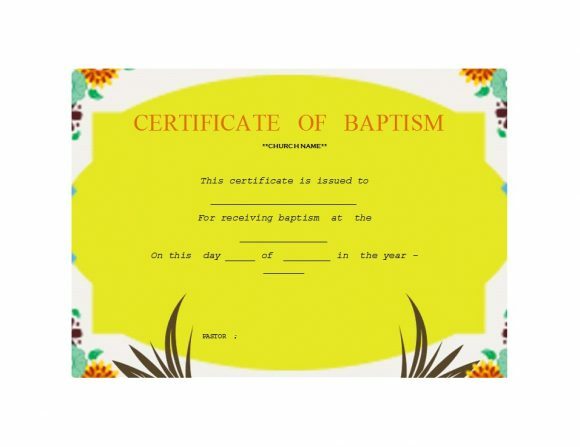 If you don’t remember when or where you got baptized, you can contact godparents anytime. Either that or ask them if they have a copy of the certificate you need.